Best Copper Cookware Sets in 2019 | 5 of the best rated and reviewed! Today, we are going to tackle a hot topic among cookware enthusiasts – copper cookware. Copper is one of the materials most talked about in discussions about cookware. People either love it or hate it, although this might just because they have never tried it. The truth is, copper is one of the best heat conductors out there. Copper cookware heats up fast and cools down just as fast which allows for amazingly precise heat control. The main problem with copper is the fact that it is a reactive metal. That means it can change the taste of the food you are cooking, especially if you are cooking acidic foods like tomato sauce. For this reason, copper is rarely used by itself. Copper cookware is usually lined with another metal. While tin was used in the past, modern copper cookware is lined with stainless steel in most cases. Copper looks amazing when polished, and a copper cookware set adds a touch of class to any kitchen. Moreover, the copper cookware sets on our list today are some of the most functional, versatile, and durable sets we have ever encountered. Good copper cookware sets are not easy to find though, but there are a couple of amazing options available. All of the cookware sets on this list come from reliable, well-known manufacturers. We have tested them all and weighed out the pros and cons. Each of these sets has its advantages – it’s up to you to decide which one suits your needs and your budget the best. This guide is here to help you make the right decision when choosing your new copper cookware set. 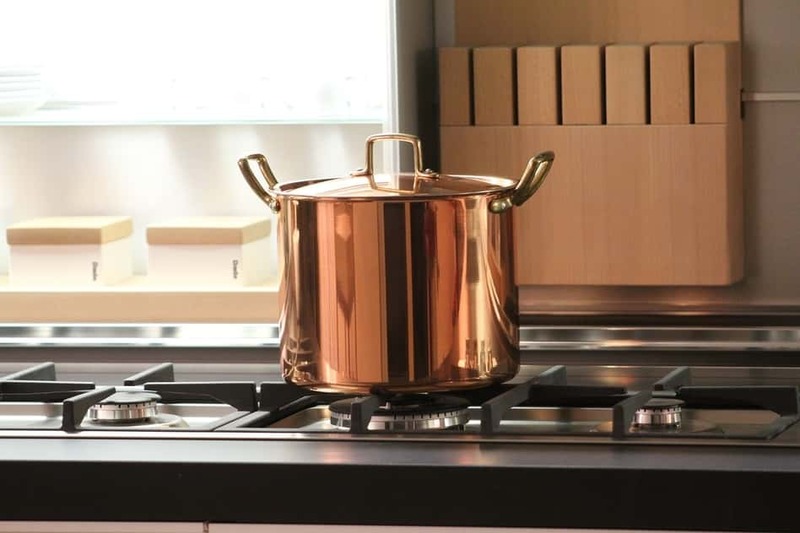 Many of the most famous manufacturers of copper cookware come from France and this is because there is a long tradition of working with copper in this country. For this reason, it doesn’t surprise us that one of the best copper cookware sets we have found comes from a French manufacturer, Mauviel. The company was established almost 200 years ago in Villedieu-les-Poêles, a village known for its long history of metal-work, especially for producing copper cookware and copper basins. Today, Mauviel still makes high-quality cookware that is adapted to modern standards and used in professional kitchens all over the world. The copper body allows the cookware to heat up and cool down extremely fast, while the thin stainless steel lining on the inside keeps your food safe and makes cleaning easier. The pots and pans from this set range in thickness from 1.5 mm to 2.5 mm. So what exactly does this set contain? Two frying pans, two saucepans, a saute pan and a large stockpot. The saucepans, the saute pan, and the stockpot all come with lids, so you get 4 lids in total. The lids are made of copper with stainless steel handles. All of the pieces in these are carefully designed without any room for mistakes. Therefore, it doesn’t come as a surprise that even the handles on the pots and pans are made with exceptional attention to detail. They are weighted to provide added balance and made from stainless steel with an iron electroplated finish which remains cool to the touch. Finally, Mauviel has also included a box of Copperbrill Cleaner with this set, to help you keep the exterior of your pots and pans nice and shiny. Mauviel cookware is really amazing, and you don’t have to take their word for that – every piece of cookware comes with a lifetime guarantee against manufacturing defects. The only downside is that copper cookware can’t be used with induction stovetops. However, Mauviel does offer an interface disk that allows you to adapt your induction stovetop to be used with copper cookware. The Mauviel M’heritage 150S 10-Piece Copper & Stainless Steel Cookware Set really deserves to be called a top-of-the-line cookware set. Each pot and pan was beautifully designed with attention to the smallest details, resulting in pieces of cookware that are not only beautiful, but also highly functional. 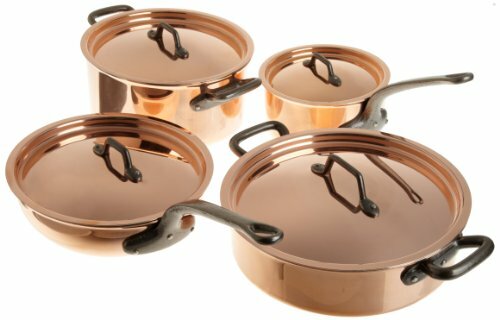 The Matfer 915901 8 Piece Bourgeat Copper Cookware Set also comes from a manufacturer with a long history. Matfer Bourgeat is a French family-owned company with a long tradition of making high-quality cookware. The company was established in 1814 in Normandy and they have been in the American market for 25 years now. 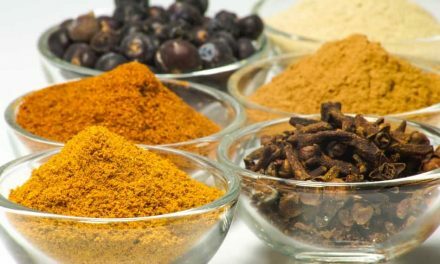 During this time, they have become a very well-known name in professional kitchens and cooking laboratories. Today, they offer a wide range of cookware and kitchen utensils made from various materials, including stainless steel and ceramic, but their copper cookware remains a timeless staple. The Matfer 915901 8 Piece Bourgeat Copper Cookware Set brings together the high heat conductivity of copper and the toughness of stainless steel. All of the pieces in this set are made with a 2.5 mm thick copper outside layer, lined by an 18/10 stainless steel layer on the inside. The copper outside provides amazingly even heat distribution. On the other hand, the stainless steel lining is easy to clean and maintain and completely safe. The stainless steel layer is only 0.1 mm thick which allows the cookware to still provide the amazing heat-conducting properties of copper. Both layers are polished which results in an elegant, shiny look. Pure copper develops a natural patina, though, so you’ll need to polish the exterior of these pots and pans on a regular basis if you want to keep the gorgeous shiny look. The Matfer 915901 8 Piece Bourgeat Copper Cookware Set contains four pots and pans in total. Each of them comes with a nice drop-in lid that fits tightly. The smallest pan in this set is the 7-inch saucepan. Copper saucepans like this one are perfect for candy making. If you like working with sugar, or just want to try your hand at it, you’ll certainly enjoy this little saucepan. The thick copper body of the pan will allow you to control the temperature inside with perfect precision, which is really important for candy making. Moreover, all of the pots in this set have nice curved rims that prevent dripping. However, this is not the only thing you can do with this saucepan – it will work just as well for making sauces or even reheating food. The rest of the pans included in this set are a 9.5-inch casserole dish, a 9.5-inch flared saute pan and an 11-inch brazier. All of them come with weight-balanced cast iron handles that make every pot and pan feel amazing in your hand. The Matfer 915901 8 Piece Bourgeat Copper Cookware Set contains a saucepan, a casserole dish, a saute pan, and a braising pan. 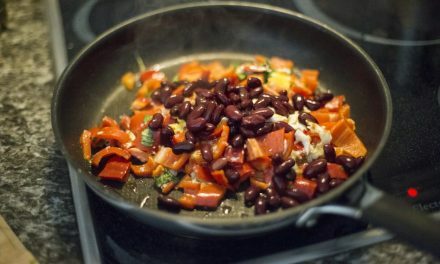 In other words, it contains all the essentials you need to experience the benefits of copper for various cooking techniques. If you are looking for top-notch copper cookware, you should definitely consider this set from Matfer Bourgeat. Lagostina was founded in 1901 in Omegna, Italy by a father and his son – Carlo and Emilio Lagostina. Back then they launched their first stainless steel cookware collection which came to be immensely popular and eventually exhibited at the MOMA. Today, they make a wide range of cookware from various materials, including stainless steel, hard anodized aluminum, and copper. Their Martellata Copper collection features pots and pans made with three layers of metal. Each layer is made of a different metal – copper, aluminum, and stainless steel, and the tri-ply designed brings out the best features of each of those! The external layer is made of pure red copper with a traditional hammered finish. Copper cookware is always beautiful, but the hammered finish takes it to a whole new level! Thanks to it, these pots and pans have a gorgeous vintage look, but the aluminum core and the stainless steel inside layer give it the cutting-edge qualities of modern cookware. The internal layer is made of high-grade 18/10 stainless steel. Unlike copper, the stainless steel doesn’t react with the food inside, so it keeps the flavors intact. 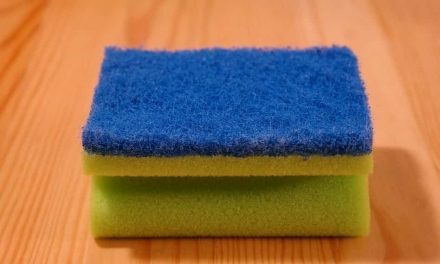 It’s also easy to clean and very hard to scratch. For this reason, these pots and pans can last for ages! Finally, the thick aluminum core sandwiched between the stainless steel and the copper allows for amazingly even heat distribution. 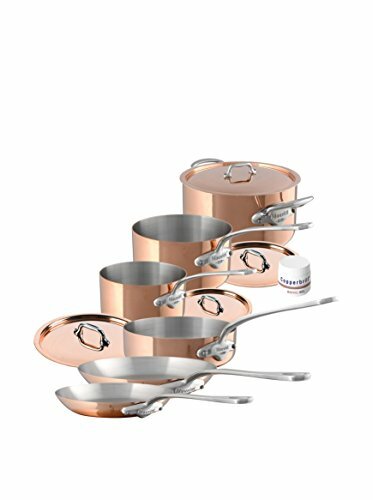 The Lagostina Q554SA64 Martellata 10-piece set, in particular, contains all the pots and pans you need to take your cooking to the next level by introducing the amazing qualities of copper. The set includes 2 skillets, 2 saucepans, a deep saute pan, and a stockpot. The smaller skillet is 8 inches wide, while the larger one has a diameter of 10 inches. These are the most useful skillet sizes for everyday cooking at home. They are perfect for making eggs and breakfast foods, but you can also doo much more with them. The saucepans, the saute pan, and the large stockpot all come with stainless steel lids with. The lids fit in nicely with the copper exterior of the pots and pans and the stainless steel handles on them. The handles on the lids are securely riveted and have a distinct shape that makes it super easy to grasp the lid from above. The skillets, the saucepans, and the saute pan all come with one long stainless steel double-riveted handle. What we especially liked is the fact that these long handles are raised at the beginning. The shape balances out the weight of the pan when you hold it up which makes it easier to move heavy pans. Finally, all of the pots and pans in this set have flared rims. These rims help the pots and pans keep their shape for longer and also prevent messy pouring. This cookware set from Lagostina brings together the traditional feel of hammered copper and the amazing performance of the modern tri-ply design. 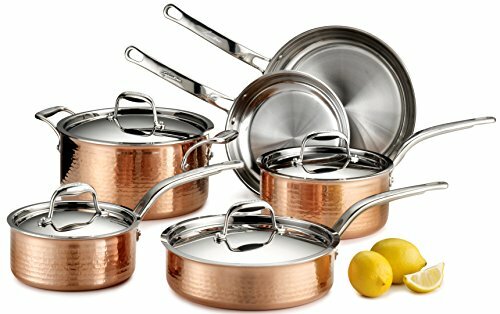 Compared to Mauviel or Matfer Bourgeat cookware sets, this set from Lagostina is quite affordable Definitely one of our favorite copper cookware sets. Originating in Perrysburg, Ohio, Calphalon has been around for more than 50 years with a mission of offering functional high-quality cookware at reasonable prices. While they are known mainly for their awesome hard anodized cookware, they have also created this cookware set that combines the benefits of copper, aluminum, and stainless steel. The Calphalon T10 Tri-Ply Copper 10 Piece Set boasts a brushed copper exterior which gives the pots and pans a traditional look, but also fits in seamlessly into modern kitchens. Moreover, the distinctive look is not the only benefit these pots and pans get from the copper exterior. Thanks to the high conductivity of copper, these pots and pans also respond to heat really quickly. Since copper reacts with food, it is usually coated with some other metal and in this case, it is stainless steel. A stainless steel cooking surface is basically always the best option. Stainless steel is non-reactive, easy to clean, and resistant to corrosion and rust. The pots and pans in the Calphalon T10 Tri-Ply Copper 10 Piece Set also have an aluminum core layer nested between the copper exterior and the stainless steel internal layer. The aluminum core spreads all the way up the sides of the pans, providing even heat across the cooking surface. 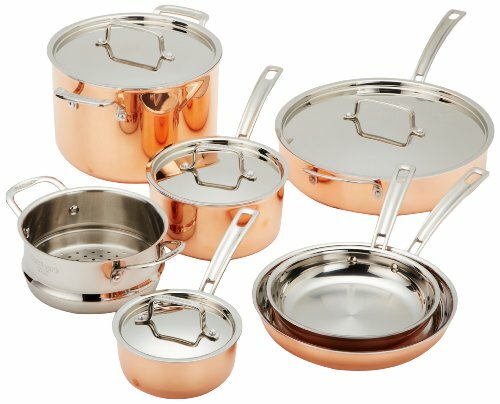 This 10-piece copper set contains six pots and pans altogether, accompanied by four lids. What exactly are these pots and pans? First of all, there are two frying pans in standard sizes – 8 and 10 inches. Thanks to the heat responsiveness and to the sleek stainless steel interior, these frying pans can be infinitely useful. They are quite durable too so they can withstand years of everyday use. And trust us, you’ll really want to use them every day. The set also includes 2 saucepans – a smaller one with a capacity of 1.5 quarts and a slightly larger one with a capacity of 2.5 quarts. Finally, there is also a 3-quart saute pan and a 6-quart stockpot. Overall, this is a nice, functional set with a classic look. One thing is for sure, you’ll certainly use each of the pots and pans in this set. The saute pan is perfect for sauteing and braising, the stockpot will make tasty soups and stews, and the skillets and saucepans will do everything else. The Cuisinart CTP-11AM Copper Tri-Ply Stainless Steel 11-Piece Cookware Set features a tri-ply construction with a copper exterior, an aluminum core, and a stainless steel cooking surface. This is the best possible way to combine these three materials when making cookware. Having that in mind, it’s no wonder that we loved this set and how easy it is to achieve awesome results when cooking with it. The set contains 11 pieces altogether. There are two saucepans, a saute pan, and a stockpot, all of them with lids, accompanied by two frying pans. The eleventh extra piece is a stainless steel steamer insert. Otherwise, the Cuisinart CTP-11AM Copper Tri-Ply Stainless Steel 11-Piece Cookware Set would have been just like any other 10-piece set, but the steamer insert is a really nice addition. 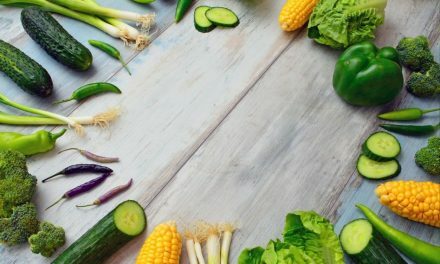 If you are interested in healthy cooking you’ll surely enjoy steaming vegetables. After all, steaming is one of the healthiest cooking methods. We do love steamed vegetables, but enough about the steamer. Let’s talk about the beautiful little copper saucepans you get in this set instead. The smaller one is really small – it’s capacity is only 1 quart. This is a perfect size and shape for candy making, though. Even if you’re not interested in candy making, we believe you’ll find this little saucepan useful – for making tea, at least. The larger saucepan is actually not so small. With a capacity of 2.5 quarts, it’s perfect for making sauces or small batches of soups, for example. However, the large saute pan might just be the real star of this set. It’s quite wide and with a capacity of 5 quarts, it can cook a lot of food. If you cook in large batches, the saute pan might get quite heavy too, but it has a nice helper handle that will allow you to lift it securely even when full. Moreover, cooking with this saute pan is quite enjoyable – thanks to the copper exterior and the aluminum core, the temperature is distributed quite evenly throughout the inside of the pan. As a result, your dishes will always be perfectly cooked. The Cuisinart CTP-11AM Copper Tri-Ply Stainless Steel 11-Piece Cookware Set is a reasonably priced cookware set that provides impressive performance. The combination of copper and aluminum enhances the heat distribution and the responsiveness of these pots and pans, while the stainless steel interior makes cleaning a breeze. If you are looking for a durable and versatile cookware set, this might just be it. Copper cookware can be more expensive than some other options, but investing in a good copper cookware set can be considered a long term investment. These pots and pans and durable, versatile, functional, and they will hardly ever go out of style. The only downside we can find to copper is the fact that you can’t wash it in the dishwasher. However, all of the pots and pans on this list have stainless steel cooking surfaces, which should make washing by hand reasonably easy. The Mauviel M’heritage 150S 10-Piece Copper & Stainless Steel Cookware Set and the Matfer 915901 8 Piece Bourgeat Copper Cookware Set both feature old-school copper cookware lined with stainless steel. These pots and pans will really let you experience the unique feeling of cooking with copper. On the other hand, the sets from Lagostina, Calphalon, and Cuisinart all have an aluminum core added between the copper exterior and the stainless steel interior. This is the modern version of a copper pan – reliable and infinitely versatile. As we have mentioned before, both options have their advantages. Choose the one that matches your style the best, although we doubt that you’ll be disappointed with either one.